The Ultimate Buffalo Chicken Macaroni & Cheese—Easy Super Bowl Snack! / Hey, EEP! The Ultimate Buffalo Chicken Macaroni & Cheese—Easy Super Bowl Snack! Okay, lovely friends! Super Bowl Sunday is less than one week away and I'm dying to know what your plans are: Are you watching/hosting/planning something delicious? Fill me in! I spent last Friday dreaming up a spread of easy snack recipes inspired by my favorite game-day indulgence—Buffalo Wings!—for the Good Housekeeping website. I'd love to share a few on the blog this week if you're interested. 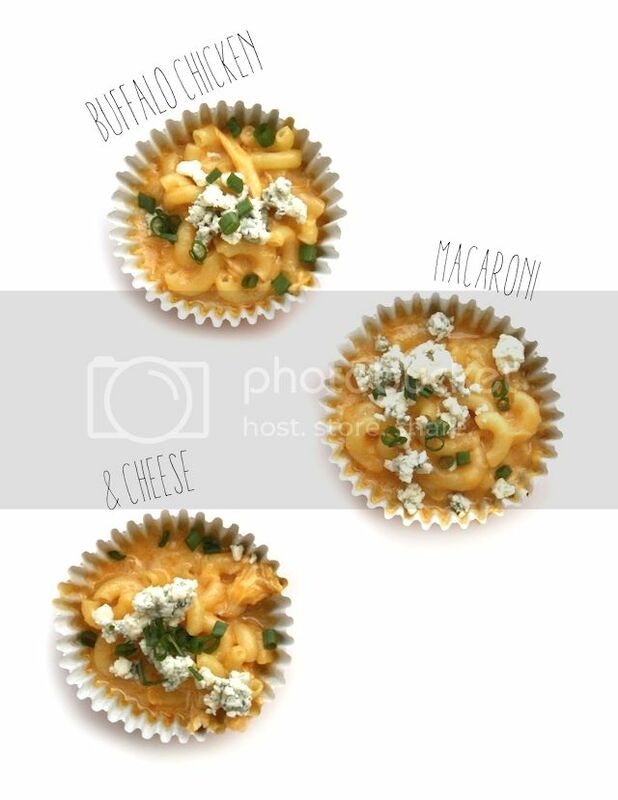 First up, individual Buffalo Chicken Macaroni & Cheese cups topped with crumbled blue cheese and snipped chives. Rather make one big tray? Use a 9-by-13-inch baking dish, instead of the cupcake liners! 1. Preheat the oven to 350˚F. Line two muffin pans with foil liners; lightly coat with cooking spray. 2. Bring large saucepot salted water to boiling. Add elbows and cook as the label directs. Drain well. 3. Meanwhile, in another large saucepot, melt the butter over medium heat. Add the flour and cook, stirring, 2 minutes or until pale golden. Stir in the milk; cook, stirring, 2 minutes or until thickened. Stir in the Cheddar, Monterey Jack, garlic powder and salt; cook, stirring, 4 minutes or until melted. Stir in the hot sauce, chicken and elbow s until combined. 4. 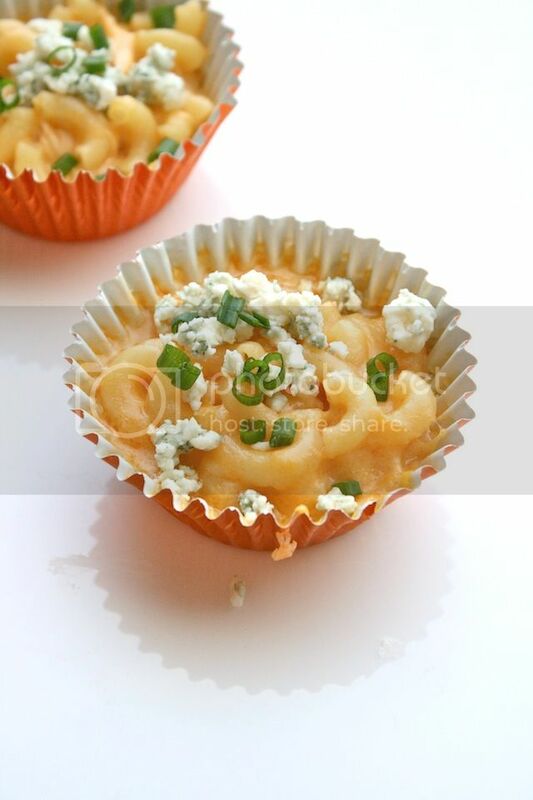 Divide macaroni and cheese among prepared liners. Sprinkle each cup with 1 teaspoon crumbled blue cheese (continue to full recipe).